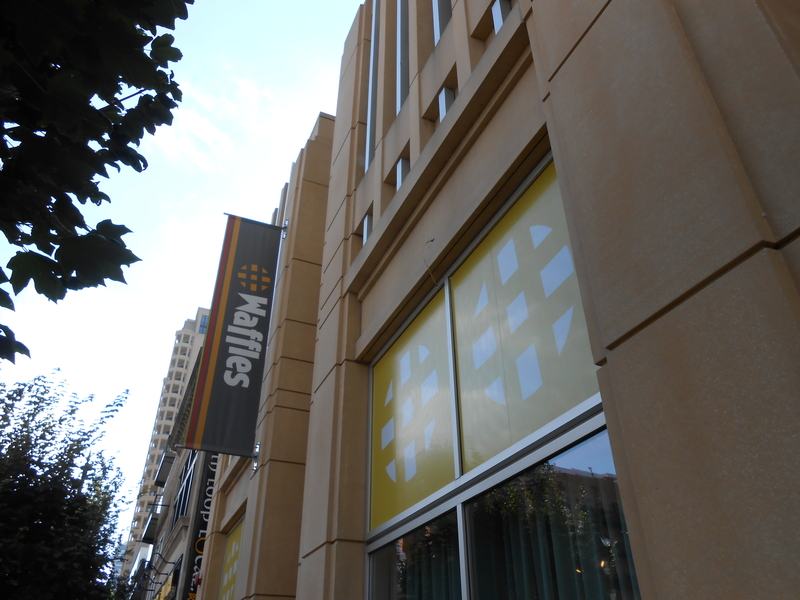 Waffles is a restaurant found in a couple locations in Chicago. They are open from 8 am to 7pm Monday through Friday and from 8-3pm on Sundays at their 1400 S. Michigan location. They have one more location in Lakeview. I went to the one on Michigan in the South Loop. Since it was still somewhat warm out there were people sitting outside. I went around 1pm for brunch. It wasn’t very busy but I was there at an off peak time. Still they sat me at the bar which changed the atmosphere to a greasy diner feel. I got to watch the cooks on the other side of the counter make the waffles as I drank water and waited on my friend. 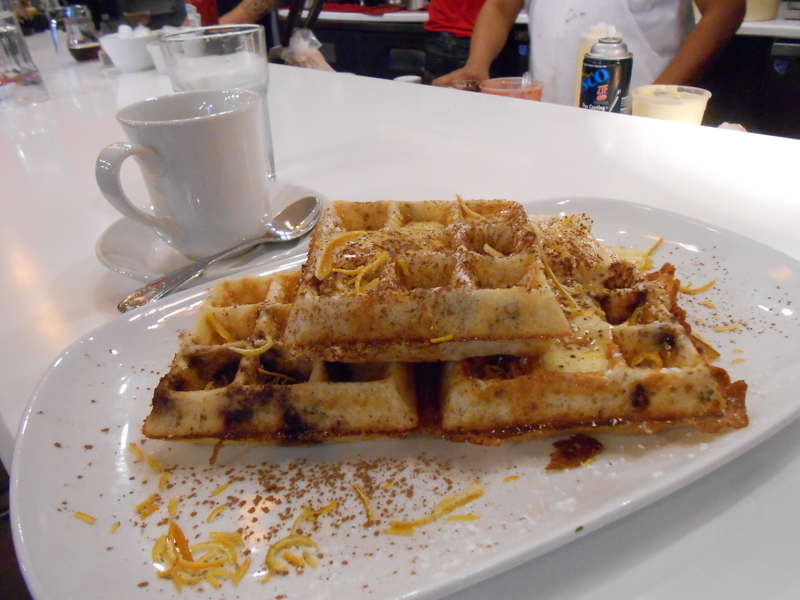 The restaurant does many different kind of waffles, anything from plain, to sweet or savory. I wasn’t quite feeling adventurous enough to try their chicken and bacon waffles or any of their other savory waffles. 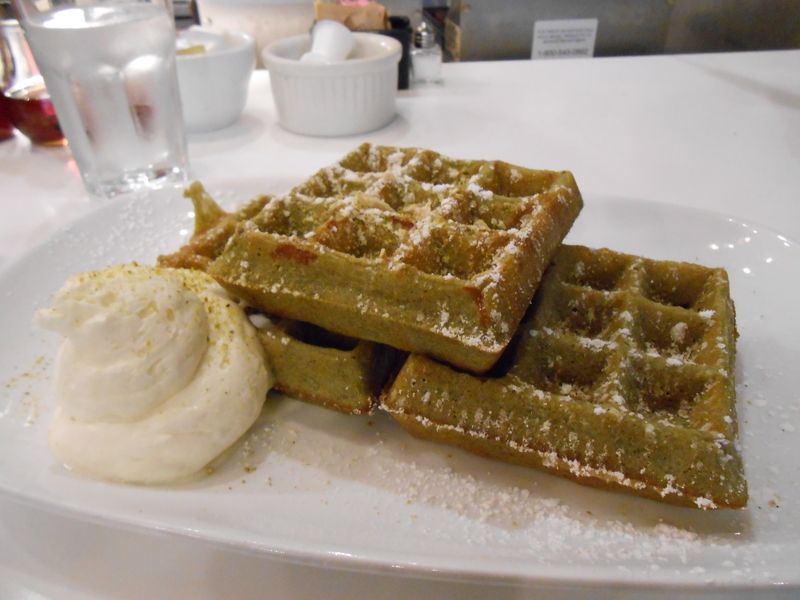 Instead I decided on the green tea waffles. As I was sitting and watching the cooks make the waffles I noticed that the sweeter waffles were being made more, I hadn’t noticed a single cheddar and short rib or albondigas waffle pass, but I also wasn’t watching the entire time. Some of their other waffles come in a gluten-free option. They also had pure maple syrup or sugar-free syrup available for $1. The syrup I used was just the sticky half full jar in front of me that I later had to exchange for another because my friend and I used all of it. My green tea waffles were good. The waffles came with powdered sugar on top and candied ginger that gave it a spicy sweet that caught me off guard. They also made a tower of lemon ginger Chantilly cream on the side with ground pistachio on top. It was a bit strong and a very heavy cream so I didn’t eat that much. My friend ended up ordering the Mexican Chocolate Waffle. It had shaved orange over it which was refreshing and spicy cocoa powder and shaved dark chocolate. The Anglaise cream on her plate was orange flavored and dusted in the chocolate. The spicy cocoa powder wasn’t really spicy and the orange was very refreshing.